“For a day in thy courts is better than a thousand. I had rather be a doorkeeper in the house of my God, than to dwell in the tents of wickedness”. Martha Louise Boyd Bennett “Sister” was born to Louise Ramsey Boyd and Robert Willie Boyd in Augusta, GA on Saturday, April 13, 1946. On Tuesday, April 2, 2019 at the Doctors Hospital in Augusta, GA, Martha made her peaceful transition from labor to reward. She joined the Woodlawn C.M.E. Church of Harlem, GA at an early age. Martha was a member of the Usher Board and the Steward Board for sixty dedicated years. She also served as the Church Secretary, a member of the Missionary Board for Woodlawn C.M.E. Church of Harlem, GA, the C.S.R.A. 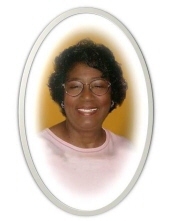 Ushers Committee, a member of the Masonic Lodge in Harlem, GA and Thomson, GA. She was also a member of Trailblazer Advocacy Group for breast cancer research. Martha attended church regularly until her health declined. Her greatest love was her family. She enjoyed playing cards and a game of bingo in her spare time. Martha would often visit with family members and friends or just the sick-and-shut-in at the nursing home. Whenever she could, she would attend the Columbia County Senior Center. Although our beloved one has walked the path that we all must walk, her legacy of love will linger on in our hearts and minds forever. She will be missed more than words can say, yet remembered with so much love. Precious loved-ones who have preceded her in death are: her parents, Robert & Louise Boyd; seven brothers, George Boyd, Wilson Boyd, Henry Boyd, John Boyd, Willie Fred Boyd, Robert Boyd and Ellis Ramsey. Wonderful memories are left to be forever cherished by those who has survived her: two daughters, Barbara Ann Bennett of Harlem, GA and Marilyn (Willie, Sr.) Griffin of Augusta, GA; one son, Jonathan, Sr. (Stephanie) Bennett of Wrens, GA; six grandchildren, Jasamine Bennett, Jessica Johnson, Marquett Bennett, Johnathan Bennett II, all of Harlem, GA, Willie Griffin, Jr. and Gabriel Griffin, both of Augusta, GA; a great-grandson, Carlos A’Keem Valdez, Jr. of Harlem, GA; one brother, Eddie (Louise) Boyd of Harlem, GA; four additional sisters-in-law, Lula Dean Boyd, Mamie Boyd, both of Harlem, GA, Penny Boyd of Grovetown, GA and Claudia Mae Boyd of Augusta, GA; one special niece, Theresa Rogers of Augusta, GA; a god-daughter, Wanda Ann Smith of Harlem, GA; two special friends, Freddie Richardson of Grovetown, GA and Lyndia Kay of Myrtle Beach, SC; a host of additional nieces, nephews, cousins, other relatives and many additional sorrowing friends. To send flowers or a remembrance gift to the family of Martha Louise Boyd Bennett, please visit our Tribute Store. "Email Address" would like to share the life celebration of Martha Louise Boyd Bennett. Click on the "link" to go to share a favorite memory or leave a condolence message for the family.